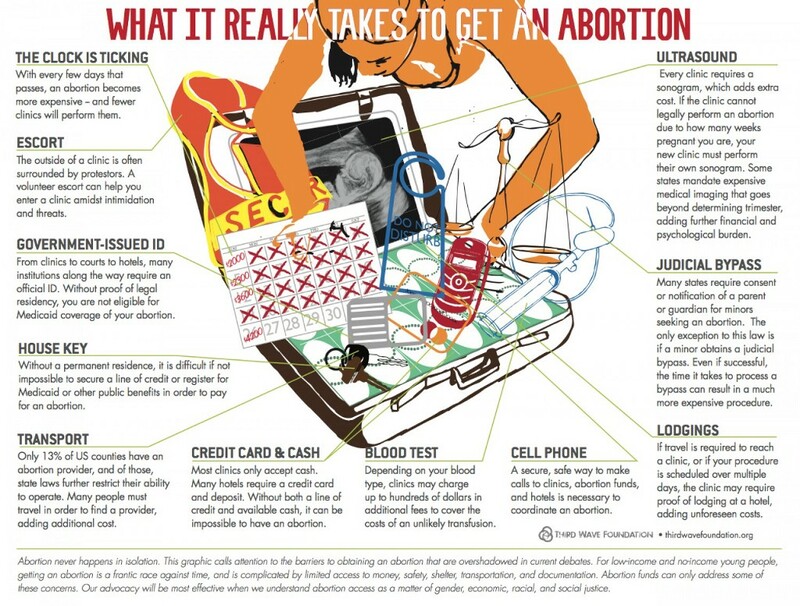 Here are some things you might need if you’re getting an abortion: a bus ticket, or gas money, or fare for public transportation, or a ride to the clinic. Child care, because statistically, you likely already have a kid. The day off from work (or more than one day, depending on where you live). A place to stay if you are traveling. And, of course, the money to pay for the abortion, which might cost you anywhere from $0 (if you have insurance that covers the procedure) to $700 or more, a cost determined by how far along you are in the pregnancy and the laws in your state or the state where you’re getting the abortion. So what happens if you need an abortion and you can’t afford it? What if you don’t have insurance, or you don’t have the money to travel to another state? What if you live in a state with a 24- or 48-hour waiting period, which means your first trimester abortion just became a second trimester abortion, which means it’s more expensive? What do you do? Breathe. It’s okay. That’s why abortion funds exist. Abortion funds are provided by non-profit organizations that finance abortions for those who can’t afford them. Most abortion funds are local or regional, and you can find out if your state or area has one by visiting the website for the National Network of Abortion Funds. In Tennessee, Targeted Regulations of Abortion Providers (TRAP laws)exist in two forms: a 48-hour waiting period, and informed consent, where a licensed MD must read the patient a script detailing what the abortion involves and any health risks they’re about to undertake (which look shockingly similar to those they’d face if they went through with the pregnancy). These laws increase the cost of an abortion about $300, since the provider is needed for twice as long. What was once a $400 procedure becomes a $700 procedure, and that’s not including sedation. Because of the proximity of Memphis to Mississippi (a state with only one abortion clinic) and Arkansas, the state sees a lot of out-of-state patients. Calvasina told me that the same patient once came from out of state via taxi twice in one week. Sammy Lifson is on the board of the Eastern Massachusetts Abortion fund, which services the Greater Boston area. EMA makes grants to women with appointments at affiliated clinics. Case managers decide how much money is allotted to each person looking for help. Money is allocated on a weekly basis based on a number of factors, such as if the patient has insurance (most turn out to be eligible for Medicaid, which covers abortion in Massachusetts) and how much money they can get from family and/or friends. “We talk a lot about “closing the gap,” says Lifson. “[We’re looking at] what you have versus what you need, and trying to make that amount smaller. In most cases, we can fund callers and fill the gap.” Because EMA operates in an area with many donors and resources, the fund is able to cover many associated costs: T passes, traveling, and more expensive procedures. They also make donations to funds in other states, such as a $15,000 grant to a fund in Texas’ Rio Grande Valley, and to fund callers in nearby New Hampshire, the only state in New England without Medicaid funding or an abortion fund. The real question, of course, is why we need these funds at all in a country with relative financial stability. Despite the existence of Roe v. Wade, abortions are becoming more and more difficult to access in the U.S. When abortion became legal in 1973, Medicaid covered the procedure, but the 1976 Hyde Amendment banned the program from continuing to do so. The result is that the cost of an abortion is financially prohibitive for many, especially poor women of color. Hyde, of course, was just the beginning of restrictions on abortion: the list now includes mandatory ultrasounds, waiting periods, physician scripts, judicial bypass, and others. The more outlandish the restrictions, the more complicated and more expensive even the most basic early abortion can be. There is no legislation governing abortion funds; they’re all grassroots organizations and therefore rely on private funds. According to the National Network of Abortion Funds, over 200,000 women seek help from abortion funds a year, but there isn’t enough money to help everyone. You can make a huge difference by funding abortions in your state, or in other states such as Texas or Louisiana, where access to abortion is particularly bleak. Visit www.fundabortionnow.org to find out how you can help. Chanel Dubofsky’s work on gender, sexuality, religion and reproductive justice has been published in Cosmopolitan, Rewire, The Frisky, and more. You can find her on Twitter at @chaneldubofsky.